That space flight sims are making a comeback is utterly bizarre. That the genre has regained momentum and is producing things like Star Citizen or Elite: Dangerous isn’t bizarre, it’s that it ever stopped being a prominent genre in the first place. 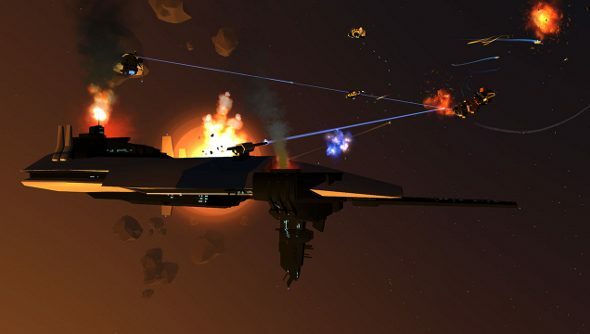 Potentially just as intriguing as the vast, detailed sims built by genre vets are games like Enemy Starfighter, with its minimalist art style and mechanics that are as evocative of Homeworld or Flotilla as they are Elite or Freespace. It’s returning to the Indie Megabooth at PAX this year – our Rob took a gander at Enemy Starfighter at PAX East – which is as good an excuse as any for a new trailer. It’s being designed with VR in mind, using those head tracking wizardry, and Marauder Interactive will be showing it off using the Oculus Rift DK2. Enemy Starfighter can be played without a VR device, though, and if slapping some tech on your face isn’t your cup of tea, you’ll be able to take for a spin using a traditional setup too. Hopefully we’ll see some of the tactical elements this time around as well as the pursuits and laser-filled dogfights.